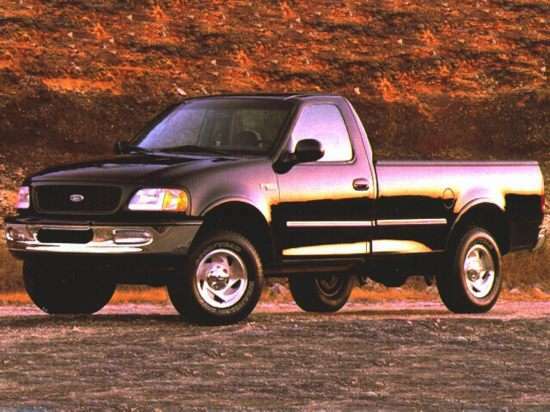 The 1999 Ford F-150 is available as a 2-door, 3-seat regular side. Starting at $15,250, the 1999 Ford F-150 Work Series 4x2 Regular Cab Styleside Styleside Sh is powered by a 4.2L, 6-cylinder engine mated to a manual transmission that returns an EPA estimated 16-mpg in the city and 21-mpg on the highway. The top of the line 1999 Ford F-150 SVT Lightning 4x2 Regular Cab Flareside Flareside, priced at $29,355, is powered by a 5.4L, 8-cylinder engine mated to an automatic transmission that returns an EPA estimated 14-mpg in the city and 21-mpg on the highway.